Most of the water around us, be it sea, river or well water, contains various dissolved minerals (Total Dissolved Solids – TDS), primarily Calcium and Magnesium salts. Water can hold a certain amount of minerals dissolved in it. Water with a lot of dissolved minerals is referred to as “hard,” and water with very low amounts of dissolved minerals is referred to as “soft”. Every condition of the water (temperature, pressure etc) has a certain amount of minerals in that it is “happy” to hold – this is the “saturation point” based on the condition of the water. If there are fewer minerals in the water than the saturation point, then the water is unsaturated and limescale will not form. If there are more minerals in the water than the saturation point then the water is supersaturated and limescale (e.g. calcium carbonate) will start to form on the sides of the pipes and equipment. When dissolved in the water, the minerals are in the form of ions (see Table 1). These are atoms or small molecules that have an electric charge, either positive (cations ) or negative (anions ) and thus, water can conduct electricity as long as it has ions dissolved in it. The fact that these ions have electrical charges means that they can be manipulated by an electric field. It is important to briefly mention the various approaches to managing water conditioning. Generally, there are 2 key categories of water treatment devices/approaches (Technology Device or Chemical Treatment). These approaches all seek to condition the water to prevent the build-up of limescale, biofilm, bacteria and algae. They follow the same basic principle by trying to encourage the ions to form small suspended crystals in the water rather than a solid mass of crystals on pipes or equipment. To do this they need to manipulate the ions in some way which is by using the electrical properties of the ions. Water becomes less able to hold minerals under certain conditions. When it is heated or experiences a drop in pressure it cannot hold onto all the ions (it becomes supersaturated) and the minerals can come out of solution to form a hard mass of crystals on available surfaces. Let us consider what happens when water is heated. The incoming cold water is unsaturated ( i.e. cold water does not form scale). When the water is heated, the saturation point lowers while a number of minerals in the water stay the same, so the water becomes supersaturated and limescale crystals will now start to form on the only “start point” available – the surface of the pipe. As more ions begin to crystallize, they form on the existing crystals, and so the scale on the surface of the pipe grows. As the minerals come out of solution to form limescale, they lower the TDS of the water. 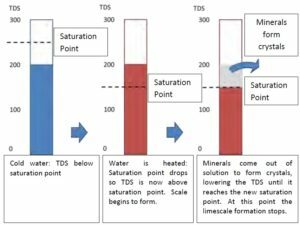 This scale formation continues until the water has lowered its TDS to the new saturation point (see figure 1). Along with scale formation in heating applications, water will collect dirt and debris (such as in swimming pools) over time, which has to be removed by a filter. All pools (other pieces of equipment such as cooling towers will have the same issues) will also need some method of combating bacteria and algae that would otherwise grow if untreated. The usual treatment is to add chemicals (chlorine in the case of swimming pools) to the water, which acts as a disinfectant. Unfortunately, chlorine can combine with organic chemicals such as urea (found in sweat and other substances) to become “fixed chlorine” (chloramines) which is a less effective disinfectant and also causes the swimming pool smell. If the pool water is heated, then as is the case whenever water is heated, limescale can form. Scale formation cause a range of problems when it forms around heaters or heat exchangers, it prevents the heat from being transferred from the heater to the water (i.e. it acts as thermal insulation). Not only does this make the heater less efficient, but it can also lead to the heating element overheating and becoming damaged. Both of these will, of course, increase costs, as will the cost of any cleaning. Scale forms on the inner surface of pipes, effectively narrowing them and reducing water flow. The scale can clog valves and prevent them from operating. In extreme cases these problems can paralyze your entire facility, significantly impacting building operations and thus your tenants while the equipment is being restored or replaced. In applications where filtering out dirt and debris is critical, such as in swimming pools, the current methods of chemical treatment are often costly because of the need to continually add chlorine to disinfect and prevent the buildup of bacteria and algae; and excessive water usage (and subsequent sewage charges in relation to excessive water usage) for backwashing to clean filters. It’s important to note there are several obvious disadvantages with using chemicals to condition water to prevent the build-up of limescale, biofilm, bacteria and algae. The water will contain less calcium. Calcium is essential for bone growth and regeneration. The water will contain more sodium (salt), which many people are trying to reduce in their diet. Softened water is considered bad to drink by many people – including regulatory bodies. The water can become more corrosive. As with all chemical treatments, the chemicals will be used up over time and will continually need replacing. The cost of the replacement chemicals over time can be many times more than the softener itself. The use of salt to “recharge” the softener means that excess salt is released into the drainage system – this can cause serious environmental problems. The concept of nucleation points is a perfect example of why a large amount of scaling often occurs at the outlet of hot water cylinders. The water in the cylinder is heated and therefore becomes supersaturated, i.e. it would like to dump its ions into crystals, but because the cylinder contains a large body of water the water in the middle cannot “feel” any surface and so has nowhere to form crystals. When the water leaves the cylinder, it is passed through a small hole. Suddenly, the supersaturated water comes in contact with surfaces which act as nucleation points and we get a large amount of scale forming. HydroFLOW is an advanced technology that offers a “whole building” or point of application solution for the management of water conditioning. In order to prevent limescale, we would like to affect the ions in the water that cause the scale. This is accomplished by applying an electric field (Hydropath Technology uses electric rather than magnetic fields) to the pipe and water inside the pipe. The Electronic Signal consists of high-frequency oscillations that gradually die away (decay) and then repeat at varying intervals (see figure 1). Because the Electronic Signal propagates throughout the entire system ( both up- and downstream), it is continually treating the water.Remember the ions have electrical charges which mean they can be manipulated by an electrical field and electric fields affect the ions much more strongly than magnetic fields. Electric fields, unlike magnetic fields, affect electric charges whether they are moving or not. This means that the Hydropath Electronic Signal is continually treating the water in the system. Furthermore, the treatment effect does not depend on how fast the water is flowing. The electric field rapidly changes direction (it is an AC field) from upstream to downstream. Positive ions are moved one way, and negative ions are moved in the opposite. The field then changes directions, and the directions the ions move are also reversed. Moving the positive and negative ions that are initially dissolved in the water in opposite directions means that they are much more likely to come into contact with each other. When they do this they stick together due to their opposite charges to form clusters. However these ions are still dissolved in the water, so at this point, there is no chemical change and no change in the TDS level. When the water is either heated or the pressure decreases, the saturation point drops. The water is now supersaturated and therefore crystals (scale) will start to form, dropping the TDS level until it reaches the saturation point. This counts as a chemical change, but the important point to note is that the chemical change is the same as would have happened without Hydropath. Hydropath has not caused any chemical change that would not have happened anyway – it has only changed where the scale forms, not how much. The crystal stays suspended in the water and when any further crystallization takes place, it does so by the growth of these crystals rather than by the formation of new crystals on the surface of the pipe. We see that by forming seed crystals, we prevent crystal formation anywhere else. The suspended crystals are ultimately flushed out of the pipe through the flow. The electric field is specifically designed to help the ions form crystals in the water rather than on the pipes (see figure 2). The timing of the pulses changes, allowing the Electronic Signal to treat all different plumbing systems. The reason the Hydropath Electronic Signal propagates, unlike the magnetic field from the other devices, is due to how the Electronic Signal is applied. One way of thinking about this is that the magnetic field is applied from outside by the magnets, whereas Hydropath technology essentially makes the fluid inside the pipe part of an electrical circuit, and induces the current within the fluid stream. so the pipe carries the current inside the fluid stream within the pipe”. This is done in exactly the same way as a transformer, by making the pipe and the water effectively the secondary coil of the transformer. Just as a wire in a circuit carries current all through the wire, so the pipe carries the current all along the pipe. Biological contamination of industrial systems and commercial systems can be a major problem, and its treatment usually requires the use of large amounts of chemicals. While we normally think of killing bacteria or algae by using chemical disinfectants, or some form of radiation such as UV light, there is (perhaps surprisingly) an alternative but the impractical method – simply using pure water. 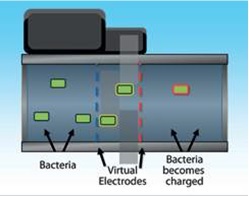 The HydroFlow technology can reduce the problem of bio-fouling common in re-circulating water system by creating “virtual electrodes” in the water, and as the bacteria pass these they become electrically charged (see figure 1). The charged bacteria attract a wetting layer of extremely pure water. 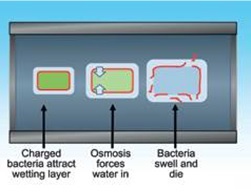 This is then forced into the bacteria by osmotic pressure, causing the bacteria to swell and die via osmotic lysis/cytolysis (see figure 2). As well as killing bacteria and algae that pass through the unit, the unit also transmits an Electronic Signal up- and downstream which will cause existing biofilm to detach. Swimming pools: one of the many benefits of Hydropath for swimming pools is that it kills bacteria. This (among other things) can lead to a reduction in the amount of chlorine used. Cooling towers: cooling tower sumps (water storage pools) can be prone to the growth of bacteria and algae. Hydropath helps keep them clear. As well as preventing the buildup of scale, Hydropath technology can remove existing limescale (calcium carbonate scale). To understand how this occurs we need to look at the chemistry of the crystallization process in a bit more detail. When the dissolved calcium (Ca) and bicarbonate ions crystallize (HCO3)2, they form calcium carbonate (CaCO3, limescale), carbon dioxide (CO2) and water (H2O) (see figure 1). More importantly, though, the process can go both ways, and water and carbon dioxide together can dissolve limescale. Water without carbon dioxide cannot dissolve scale – if it could we would never have any limescale problems at all! Limescale already present in the pipe, can be dissolved using the HydroFLOW technology. When new crystals form, they release carbon dioxide which can dissolve existing scale. When HydroFLOW is applied to a system with existing scale a number of things happen that facilitate the removal of existing limescale (see figure 2). The Electronic Signal causes the formation of clusters in the water. The carbon dioxide can now dissolve the existing scale in the system. We see that in order to dissolve the existing scale, we require carbon dioxide in the water. This, in turn, requires that we have converted the dissolved ions of calcium and bicarbonate into crystals of calcium carbonate plus carbon dioxide. In order to dissolve existing scale, we need the incoming water to contain calcium ions. If these ions have been removed chemically (i.e the water has been softened), then HydroFLOW cannot facilitate the removal of existing scale. In light commercial and steam and sauna applications and appliances where lime scale might otherwise build up quickly, for example, steam boilers, steam ovens humidifiers and evaporators reducing efficiency and causing equipment break down. The pool industry is a demanding sector because the water must be of impeccable clarity. All pools will collect dirt and debris in the water over time, and so will need to have this removed by a filter. All pools will also need some method of combating bacteria and algae that would otherwise grow; and if the pool water is heated, then limescale can also form. The usual treatment, for swimming pools, is to add chlorine to the water, which acts as a disinfectant to kill bacteria and algae in the pool. Unfortunately, its effectiveness is reduced when it combines with various organic substances (e.g. from sweat and urine chlorine can combine with organic chemicals such as urea (found in sweat and other substances) to become “fixed chlorine” (chloramines) which is a less effective disinfectant and also causes the swimming pool smell. These chloramines are less effective as a disinfectant. 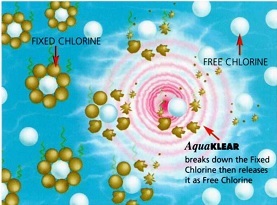 The free chlorine is continually being converted to fixed chlorine, so more and more chlorine needs to be added to the pool. In addition, the characteristic smell of swimming pools sometimes called the “chlorine smell,” is in fact not due to the chlorine itself but rather to the chloramines. Therefore, if we can break the chloramines (fixed chlorine) back into free chlorine, it will be a stronger disinfectant and have a weaker smell. It is also the chloramines that cause the painful “red eye” effect and have also been proven to contribute to the development of Asthma and COPD in people regularly exposed to this chemicals1. One method of breaking down chloramines is to add a large amount of extra chlorine into the water in a short period. This is known as “shock treatment” or “breakpoint” chlorination” and obviously increases the amount of chlorine needed, adding to the costs. The Hydropath Electronic Signal applies an electric field to the chloramine molecules, pulling them apart and thereby releasing the chlorine (see figure 7). Additionally, because the Hydropath Electronic Signal removes organic materials via improved filtration, there are fewer organic molecules to form chloramines in the first place. Hydropath Technology, therefore, eliminates the need for chlorine shock treatment, reduces the amount of chlorine that needs to be added to the pool, and reduces the “swimming pool smell” that comes from the chloramines. Hydropath Technology can save water and energy by reducing backwashing and the use of chlorine. It prevents algae accumulation, eliminates odor and reduces scum lines. Before going into detail about the process of flocculation, it is worth clarifying the differences between flock, clusters, crystals, and ions. It can be a little confusing as in both the treatment for limescale and in flocculation we are “sticking small things together”. When we discuss limescale we are talking about ions, which are charged atoms that form clusters; and when heated form crystals. When we discuss flocculation we are talking about how, over time, the water becomes contaminated with smaller particles such as dirt, dust, and dead skin – generally “bits of stuff” (see figure 5).These “bits of stuff” are stuck together (flocculate) into larger clumps (flock), which are then easier to remove by the filtering process. The other main difference is that the dirt particles that need to be flocculated are not normally charged and need to have a charge applied to them by passing through the HydroFLOW unit. The difference in size and charge means that while ions can be manipulated by the propagating sine wave, the dirt needs to pass through the unit to be charged and then be moved about by turbulence as the dirt is too heavy to move with the field. When water becomes contaminated with debris it needs to be filtered out. For example, swimming pools will need to remove the dead skin shed by swimmers, and any dirt they bring in with them. Cooling towers will pick up dust from the air, and will also contain organic materials. Picking out these “bits of stuff” is the job of a filter. In swimming pools, the level of dirt in the water is often not explicitly measured, but in industrial contexts, it is measured by “turbidity” – how “cloudy” the water is. A filter basically acts as a sieve – it allows water to pass through but blocks the debris (see figure 6). However, over time, the filter will become clogged and will require either cleaning or backwashing. HydroFLOW provides a solution to both these problems. Firstly, as dirt particles pass through the unit they become charged due to the “virtual electrodes” created. Turbulence (e.g. due to a pump) stirs up the water and the particles will meet and flocculate together due to their electric charges. These larger clumps are more easily filtered out, so any filter will be much more effective and able to filter out particles of a smaller size. Secondly, the quality and clarity of the water are greatly improved. It is possible to use chemicals flocculants to assist with this problem of debris build-up in water, but the flock created by the HydroFLOW is much more stable than the flock created by chemical flocculants (the electric charges due to the field are much stronger than those due to chemicals) and so the flock survives longer (it can survive days or weeks with Hydropath as opposed to a few hours with chemical flocculant). This is important because we want to be sure that the flock does not fall apart before we can backwash it away. The flock formed does not have a tendency to mat and so will sit on the surface of the filter (i.e the filter does not become blocked) and can be cleaned easier, reducing the frequency and duration of backwashing. Additionally, these flocks do not penetrate into the filter itself and so are much more easily removed. This means that the amount of backwash water can be vastly reduced, saving money on water and sewage charges as well as any costs for heating and chemically treating the replacement water. This is quite different than what happens with Chemical flocculants, which act like glue – they attach to the particles in the water, and then attach the particles to each other. With Chemical flocculants, although smaller particles can be filtered out, the amount of backwashing needed can actually increase. This is because the addition of extra material to the water will start to clog the filter. The flocculants can form “sticky” fibers which start to form a mat over the filter. HydroFlow’s experts will be happy to assess and discuss your needs and determine how HydroFlow can address your hard water problems. We offer a complete range of “standard” units and we can customize a design system that is right for your specific application. i RangeThe Hydroflow Industrial I Range is designed for challenging applications in industrial environments. It provides a range of water treatment benefits, including limescale protection, flocculation, and biofouling control. In addition to being much more powerful than the standard commercial units, the Industrial range is fully enclosed to IP68 standards and is designed for ease of connection to the power supply and business management systems. The Aquaklear P range has been designed to treat limescale, as well as bacteria and algae in commercial swimming pools, and in specific industrial settings, e.g. cooling towers. The AquaKlear P Range is a radical system that changes the traditional method of chemicals, chlorines, and flocculants/ coagulants usage. Using AquaKlear radically reduces costs, time & energy consumption. The benefits to bathers are enormous, making the use of the pool a pleasurable experience. Maintenance managers benefit enormously from using the Aquaklear system, assisting with the safe and secure management of the swimming pool. The AquaKlear P range is also adaptable for the whole range of pipe sizes found in commercial swimming pools, and industry. Custom units can be made to fit larger pipes. Designed and manufactured specifically for the High-Pressure Steam Boiler. This wholly unique technology does not work against nature but encourages the natural physical reaction to occur precipitating all carbonates in suspension. The HydroFLOW S Range has been designed and developed to replace conventional forms of water treatment. It allows the safe operation of Steam Boilers without the need for expertise in chemical water treatment. 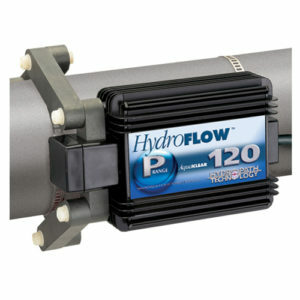 Now the Hydroflow S Range offers a radical alternative solution: chemical-free, pollution-free. Therefore the large expense and the detrimental impact on the environment from chemical usage is diminished with the Hydroflow S Range. The Hydroflow S Range is adaptable to cover all the range of Steam boilers on the market (except boilers used in steam turbines). And is also adaptable for the whole range of pipe sizes found in Steam Boilers. Custom units can be made to fit larger sizes. Designed and manufactured to treat the consequences of limescale. This specialist range is designed for industry producing in hazardous environments like chemical plants and petrochemical processes. The Ex Proof range is certified Zone 1 Class 1 Atex compliant. A special feature of the Explosion proof range is that each unit is fully encapsulated with the power supply. 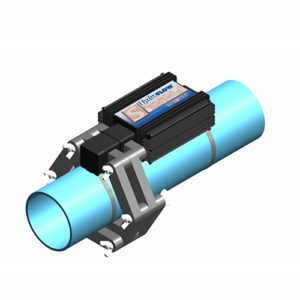 The Hydroflow Explosion Proof C Range is also adaptable for the whole range of pipe sizes. Custom units can be made to fit larger sizes. 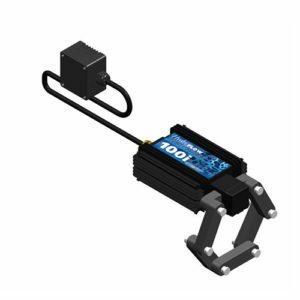 The Hydroflow Industrial I Range is designed for challenging applications in industrial environments. It provides a range of water treatment benefits, including limescale protection, flocculation and biofouling control. In addition to being much more powerful than the standard commercial units, the Industrial range is fully enclosed to IP68 standards, and is designed for ease of connection to the power supply and business management systems.